Life has been busy and full. 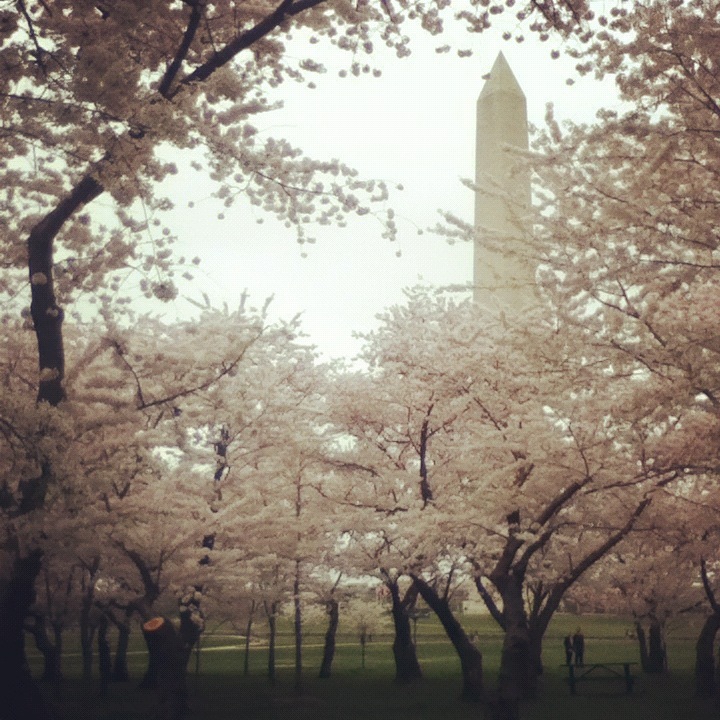 The cherry blossoms in D.C. have prettied up the city so that I’ve been spending as much time as I can indulging in their beauty. Who can sit inside and scribble when it’s so gorgeous outside? Not me! Instead of narrative, I thought I’d share some text-lite moments from this week with you. A relaxing Monday morning moment with the Surly and the cherry blossoms by 17th and Constitution. My friend and I thought we should start a photo company. We’re going to call it Cheesy Monument Photos, Inc. Taken Wednesday around midday. In other news, the zombies visited the blossoms. They did not understand the cherry blossom hoopla, and moaned about how they were too pink, too fluffy, and too sunny for their tastes. Life is hard for the zombies. Thursday morning fog at Independence and 15th. 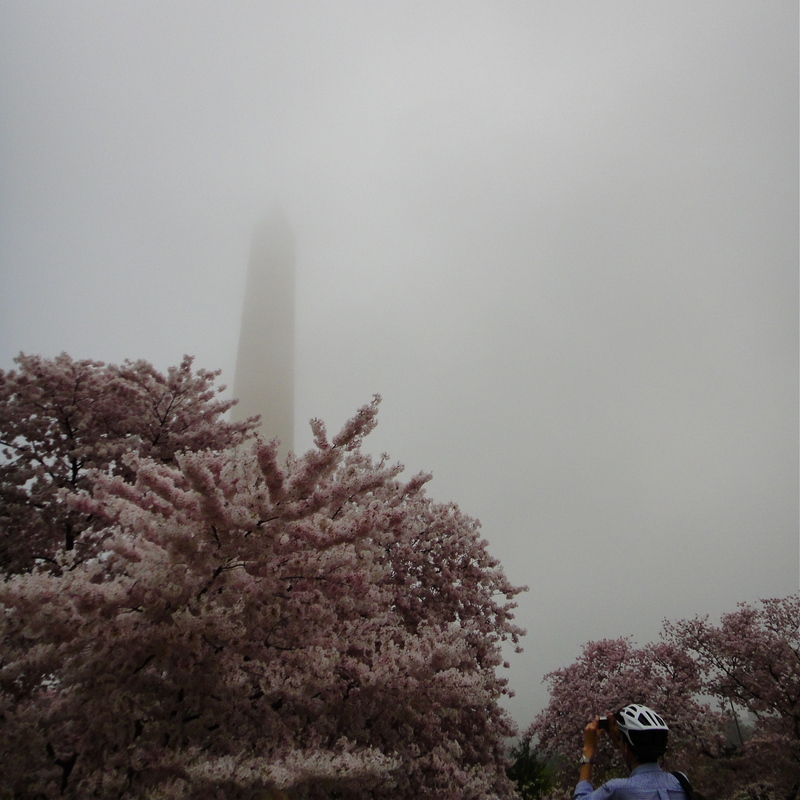 A cyclist taking a photo of a cyclist taking a picture of the Monument and blossoms. META! They were stunning today. 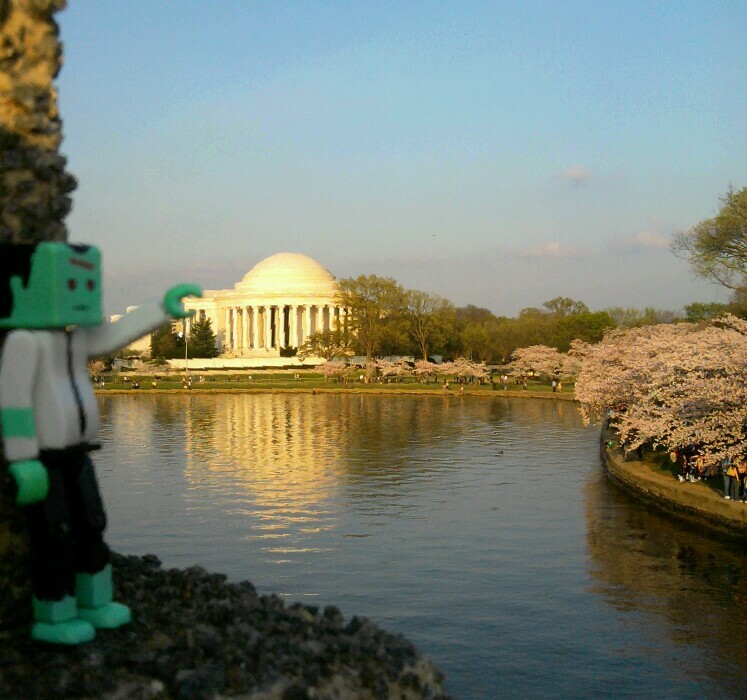 “I’m grabbing the Jefferson Memorial. 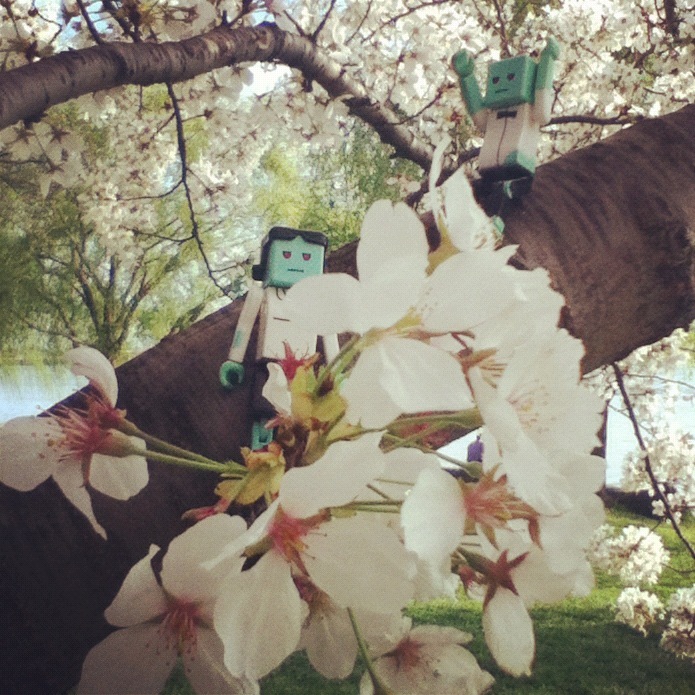 Take that, cherry trees and tourists!” Zombies can get so upset by sunny spring days and flowers. Taken Thursday afternoon. 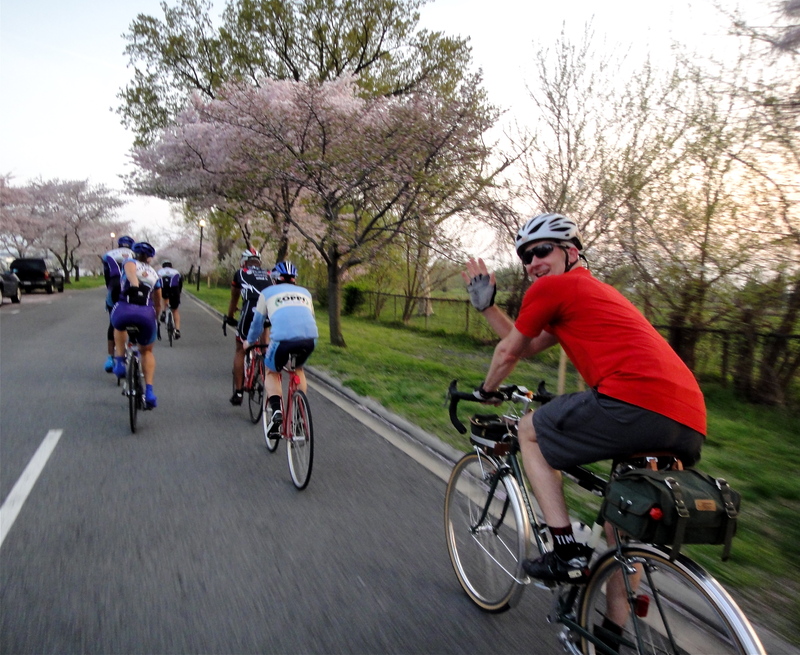 Everybody was on Hains Point Thursday evening. Cars, roadies, tourists, and Felkerino. We all were treated to a gorgeous big orange sunset, and the roadies even let Felkerino draft them for a few minutes with his SimpleOne. What a day! 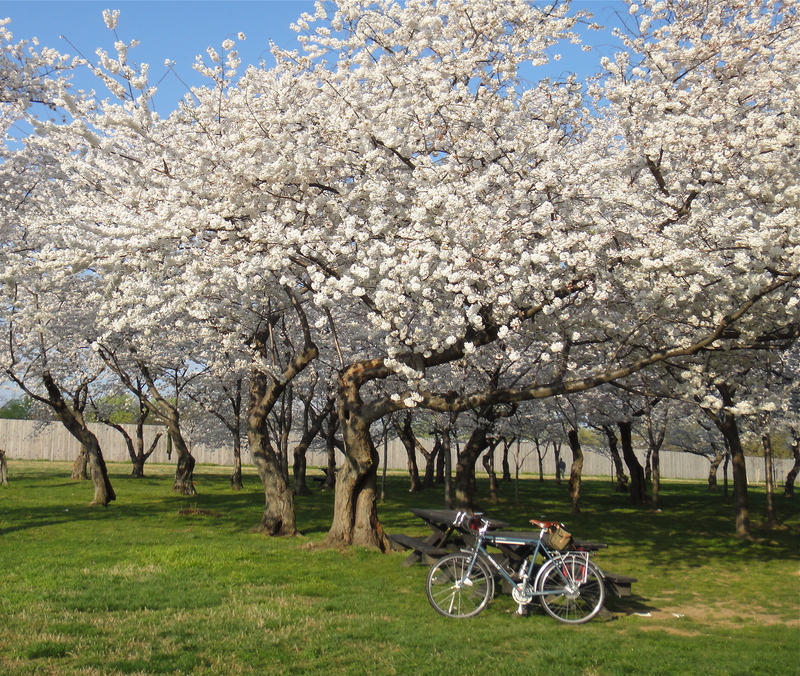 That’s all the news from your local cherry blossom blog station. Next weekend, more utilitaire goodness comes your way. Winners announced! Did someone say weekend? Why yes, please! In for a Penny, In for a Pound. Of Fleche, That Is. Definitely! I was just noticing how good your pictures are and wondering if you have/thinking you should start a photo company. I’m going to throw in my veto on the name though, fwiw. How about “Taken Wednesday around midday” instead? It’s much more randomly befitting a blog like “chaising mailboxes”. Good luck on the company, and great to meet you at #Fridaycoffeeclub! er, chasing… yes, I can read. Though chaising mailboxes sounds like fun, too! Maybe for summer I could call it “chaise lounges and mailboxes.” Tee hee! What glorious photos. “Taken Wednesday around midday” needs to be a postcard. So pretty! Our cherry blossoms don’t usually come out for another month, although they might be early this year. Ours were early this year, I think by a week and a half or so. I love riding through them. Now they’re falling and it’s on to the redbud, azaleas, and some other pink flowering tree that I don’t know the name of.